The proposed house is a two storey, split level design. Informed by the site contours, orientation and views the living accommodation is located on the upper ground level and bedroom accommodation is located at lower ground level. The overall mass and scale of the house is broken into two distinctive blocks. In plan, the main living zone runs on the Northeast - Southwest axis covered with 2 traditional 'A' pitched roofs with a flat roof link joining both blocks. These forms are reflective in scale but are a contemporary response to the vernacular homesteads and agricultural buildings typified in rural Co. Donegal. 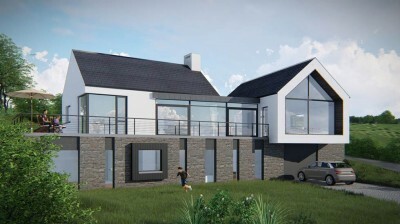 The scale of the house is also reduced in elevation with the use of stone cladding along the lower ground floor elevation. Through the use of this 'stone plinth' the two blocks read as single storey elements as viewed from a distance. By using a concrete retaining wall to the lower level this allows the dwelling to sit into the landscape thus preventing major scarring of the existing hillside.